Updated estimates on the U.S. unauthorized immigrant population were published here on Nov. 27, 2018. There were 11 million unauthorized immigrants living in the U.S. in 2015, a small but statistically significant decline from the Center’s estimate of 11.3 million for 2009, the last year of the Great Recession. The Center’s preliminary estimate of the unauthorized immigrant population in 2016 is 11.3 million, which is statistically no different from the 2009 or 2015 estimates and comes from a different data source with a smaller sample size and a larger margin of error. This more recent preliminary data for 2016 are inconclusive as to whether the total unauthorized immigrant population continued to decrease, held steady or increased. Unauthorized immigrants include those who enter the country without legal permission and those who overstay their legal visas. Declines in the number of unauthorized immigrants occur when people are deported, leave voluntarily, convert to lawful status or, in a small number of cases, die. 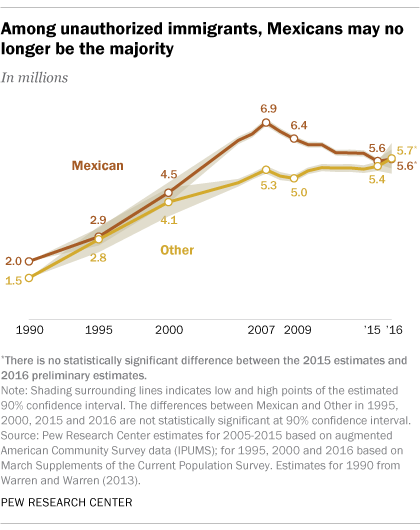 Mexicans have long been the largest origin group among unauthorized immigrants – and the majority for at least a decade – but their numbers have been shrinking since peaking at 6.9 million, or 57% of the total, in 2007. In 2014, they numbered 5.8 million (52% of the total). In 2015, according to the Center’s new estimate, they declined to 5.6 million, or 51% of the total. And in 2016, according to the Center’s preliminary estimate, the number of unauthorized immigrants from Mexico was the same, but their share fell to 50% of the total, marking the first time since at least 2005 that Mexicans did not account for a majority of the unauthorized immigrant population. 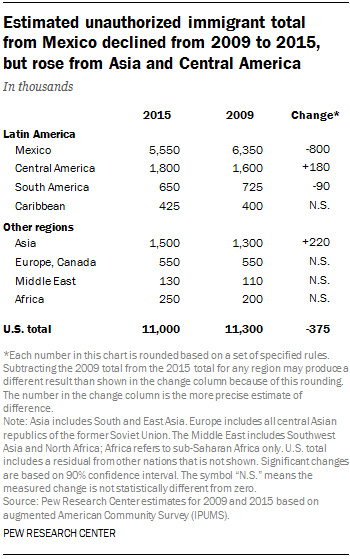 As the number of Mexicans has decreased, the number of unauthorized immigrants from other parts of the world has increased. The estimated number from countries other than Mexico declined from 5.3 million in 2007 to 5 million in 2009, but grew after that, reaching 5.4 million in 2015 and 5.7 million in the preliminary 2016 estimate. The Center’s 2016 preliminary estimates are based on census data from March 2016, in the last year of President Barack Obama’s second term. Because these estimates date from before President Donald Trump took office in January, they do not account for the impact of any of his announced policy changes, including promises of expanded border protection and increased actions against unauthorized immigrants. However, a more recent data source about unauthorized immigration – the number of apprehensions at the Southwest border – fell in January, February and March after ticking upward last spring and fall, according to U.S. Customs and Border Protection statistics. Meanwhile, in a potential sign of the changing makeup of the unauthorized immigrant population, there were more apprehensions of non-Mexicans than Mexicans in fiscal 2016 for just the second time on record (the first was in fiscal 2014). 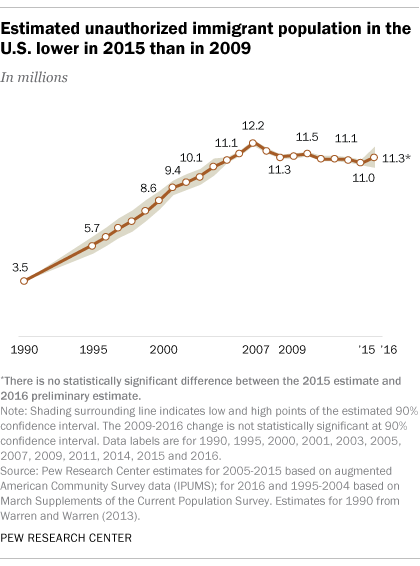 Despite its recent decline, the estimated unauthorized immigrant population remains more than triple its size in 1990, when it was about 3.5 million. The unauthorized immigrant population rose rapidly after that, peaking at 12.2 million in 2007, before falling during the Great Recession during 2007-2009 and then levelling off, as declines in unauthorized immigrant totals from Mexico and a rise from other countries kept the total roughly in balance. The 2016 estimate is considered preliminary because it is derived from the Current Population Survey, which has a larger margin of error due to its smaller sample size (about 70,000 households in the March 2016 data used in these estimates) compared with the American Community Survey (which had a 2015 public-use file sample size of about 1.3 million households). All other Center estimates since 2005 are derived from the American Community Survey. The estimates for 2013 and later include about 10% of unauthorized immigrants who have been granted temporary protection under Obama’s 2012 Deferred Action for Childhood Arrivals program and the federal government’s Temporary Protected Status program for immigrants potentially affected by disease, natural disaster or conflict in their home countries. The Center estimates that, since 2009, there have been an average of about 350,000 new unauthorized immigrants each year added to the total, including about 100,000 Mexicans. Before the Great Recession, Mexicans represented about half of new unauthorized immigrants. Earlier Center research found that a rising share of unauthorized immigrants have lived in the U.S. for a decade or more, as new illegal immigration has slowed. In 2014, 66% of unauthorized immigrants had lived in the U.S. for at least 10 years, compared with 41% in 2005. Only 14% in 2014 had lived in the U.S. for less than five years, compared with 31% in 2005.